Nothing is more unnerving than driving a vehicle down the road, you hit a bump and bam it cuts out on you for an instant. You are in town and at a traffic light, as soon as it turns green you let off the brake and bam it dies on you. Most people would tell you to change the crankshaft position sensor–been there and done that. Doesn’t help. Did a complete tune up with new spark plugs, wires, distributor cap–Even checked, checked and rechecked with no improvements. What else do I check??? Checked over all the wires for any cuts or frays–all are fine. Cleaned the throttle body-Enough to make it so clean you could eat off of it (well, not really). I was sitting at my local community college after my evening class talking to my mom on the phone. I had just turned the key but not started it. A few minutes later as I was getting ready to hang up I just happen to notice the light on my radio display mysteriously came back on. Ok? The following weekend I take it out to my boyfriends house to look over everything. He decides to get in while I’m not paying attention and proceeds to wiggle the key in the ignition. BAM! He kills it. Tries it again and does the same thing. Never in a million years would I have guessed after doing a hundred million common fixes would it be the ignition switch. After doing some research and talking with my brother the mechanic, I decided I would try out the Pro Comp ES3000 shocks for the front on my 1992 Jeep Cherokee. Previously I had purchased the Rancho 5000 shocks, but they only last me about four years which I was very disappointed about. While I go off roading I don’t go that often. In fact, I have not been off roading at all this year because of my extremely busy schedule with school, kids and the community organization I am involved with. The previous year I had only been off roading maybe three times. From what I was told by other off roaders it would be understandable for my shocks to wear out if I were off roading quite often. So needless to say I decided I was not going to go with Rancho shocks again. Since I knew there would be a Jeep Fest in Atlanta the first weekend of August I decided I would wait to purchase shocks until after I went there. I wanted to see what was offered and if I could possibly get them at a cheaper price than ordering them online. When I got there it was ironic that the Rancho booth was right next to the Pro Comp booth which was extremely busy compared to Rancho. I guess that was a sign for me? Plus Pro Comp had a box stuffed full of shock boots including hot pink ones I had been looking for to match the pink my best friend had painted on my D rings, diff covers, track bar and skid plates as well as my brake rotor drums. After getting in line to talk with one of the sales reps, he recommended the ES3000 shocks which I had previously looked at online. Since I have a 3″ lift he said those were the ones they include in their lift kit. When he told me the price of the shocks I knew I couldn’t turn it down. I would be saving almost $25! When I went over to pay for the shocks and boots the cashier asked me if I wanted to add the warranty to them. I talked it over with my best friend who agreed that would be ideal. From the way the cashier explained the warranty it seemed like a no hassle deal. $8 additional to add the two year warranty and if anything happened I could take them to the nearest 4 Wheel Drive Parts store to exchange them. At first the cashier and one of the store managers thought the shocks were in stock at the nearby Norcross, GA store. Once they called though they were apparently not there. I was a little disappointed since I wanted the shocks asap, but when the manager offered to ship them to me for free and said they would arrive to me by Thursday I was okay with that. So when Thursday rolled around I was out and about hoping my shocks would show up. I had been going to the 4 Wheel Parts website daily to check the status which never seemed to change at all so I was quite nervous that they would not show up. Then late afternoon my neighbor called me and said they had a package for me that was very heavy. When I got home I was like a child at Christmas time. It was a few days before I finally had the time to go out to my best friends house where he has a hydraulic lift and I could install the shocks. When we opened the boxes he was quite surprised there was some assembling to do. The bar pins had to be pressed in so be prepared if you ever decide to purchase the ES3000. It did not take very long to do the pressing of the bar pins nor installing them. For at least the last three years every time I have had to put my Jeep on my best friends lift I would always find a little transmission fluid lingering on the upper inlet transmission line towards the bottom of the radiator. Neither one of us could track it down and since it was just a very minor leak we left it alone. A little over a week ago I noticed something was leaking on the front drivers side about where the steering box is located. My first assumption was that it was one of the power steering lines at the steering box, but even after cleaning up around everything I still didn’t notice anything. I went as far as wrapping a paper towel around the pitman arm to make sure it wasn’t leaking because it always seemed to be soaked. It stayed dry for days so the pitman arm was ruled out. I kept driving it while checking the fluid levels often. Nothing was significantly losing fluids which was puzzling. Then one day after I had picked up my oldest son from school I had went to check my mail when I noticed fluid was almost pouring from underneath. So, after letting the engine cool down I took the airbox out to clean the steering box up, cleaned the lines and looked over them. That is when I noticed the upper inlet line (transmission line that connects to the radiator) was up against one of the power steering lines. As I cleaned up the line I realized I may have just found the the leak. When my best friend showed up he pulled the inlet line away from the power steering line and cranked the Jeep up. As soon as he did, transmission fluid sprayed everywhere. In order for me to get it out to his house we had to improvise. I had a left over clamp and he had an old rubber glove which he cut off a piece from. At least it would keep the leak at bay so I could get out there. On the way I stopped at Autozone to special order the upper inlet tube. Luckily there was one at the warehouse in Chattanooga meaning it would be ready to be picked up early the next morning. While there I noticed the leak was still there a little bit. As you can see in the photo below, it obviously had been rubbing for awhile. I am sure the question one would ask is why was the line allowed to rub against another line? When my radiator was installed there was not a place to attach the clip that holds the line. After I installed the replacement line I had to use wire ties to attach it through a hole underneath the radiator. The most challenging part of the repair was getting the steel line disconnected from the rubber line even when we were using the transmission line disconnect tool. Using a contact cleaner or something such as WD-40 to get up in there and clean the dirt out makes the difference. With a little effort we were able to finally get it disconnected! As you can see in the picture it was definitely rubbing for awhile. This was my first visit to the 4 Wheel Parts Truck & Jeep Fest that was held in Atlanta at the Cobb Galleria the weekend of August 4-5th. My main reason for going was to hopefully find shocks for my 1992 Jeep Cherokee with a 3 inch lift. Arriving at the Cobb Galleria, it was not anything I even pictured/expected. It seemed to be in a fancier area than I imagined. Before walking through the doors of the fest we all received some posters and a bag. The ladies handing them out were very nice and helpful. After walking inside I was really amazed at how small the fest was and also how many people were there on a Saturday. The crowd was minimal, most places were easy to walk through. Since I had been looking at Pro Comp shocks and they had been recommended to me I decided to go over to the Pro Comp area. Before I even got there I spotted a box on the floor beside a table that had the shock boots I had been wanting–Hot pink ones! Since there was not a price displayed anywhere I had to stand in line at the counter that was set up. The wait was probably around five minutes before I was able to ask about the price of the boots as well as the price of shocks. The gentleman at the counter was quite friendly and helpful. Once I got the price of the boots ($5.99) he showed me the shocks that they usually include in their 3″ lifts. Since I was at the fest, the price of the shocks were about $24 less than if I were to order them online. After writing up an order form I was sent over to the center of room to the checkout area. Before I left the counter he told me to come back after checking out and pick up some hats. At the checkout area the line was not too long and there was a nice gentleman there to direct me to the next cashier. I stood in line maybe about five minutes before I was waited on. I was given the choice of either picking the shocks up at a nearby 4 Wheel Parts store or I could have them shipped to me. I decided I would pick them up at the Norcross store that afternoon. However, after the cashier called the store he discovered they were not in stock even though the computer said they were. So, the cashier immediately offered to ship them to me for free. He then explained I could purchase the extended warranty (2 yrs) for $8.00 which I agreed to do. Another cashier stepped up and let me know if the shocks did not arrive to me by Thursday to call him. After all that I started walking around to the different booths. I was disappointed in that I did not see the Crown Automotive booth as had been advertised online and in the mailer I received. I was also surprised that there was not a lot of activity over at the Rubicon Express booth. I do have to admit that at some of the booths I felt that because I was not a man and that I had my kids with me that I was not taken seriously, except at the Pro Comp booth and check out. Overall, I still enjoyed my visit to the fest and glad I was able to finally able to experience it. Would I go to the next Truck & Jeep Fest? Yes I would like to! My boys enjoyed getting to see the Jeeps and trucks giving them ideas to share with me about what the next project should be for my Jeep. Summer 2012 has gone by fast and now school is starting in my area. That means it’s time for my Jeep to get “back to work” and be the taxi for all three of my kids. Half the summer though she sat parked under trees at my best friends house while I traveled over 8,000 miles, most of it in a friends 99 Jeep Cherokee Classic. Shortly after school ended for the year the plan was to head down to Santa Fe, Texas (and Galveston to the beach) to take my oldest son to my dad’s house while I was working The Great Race. Originally the plan was to rent a vehicle from Enterprise rent-a-car. However, after adding up the costs of adding me as a driver, plus insurance and a $150 deposit, we couldn’t justify spending over $500 to rent a car for a week. 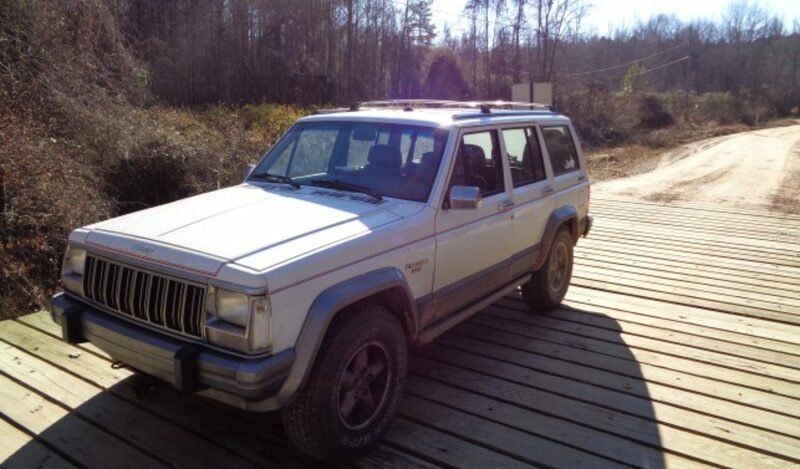 So my friend outright said lets take her Jeep instead. Besides, we had just prepared it to go on The Great Race as soon as we got back from Texas. Plus I don’t take the way Google Maps says I should. There are tolls the way it says I should go and I don’t care for traffic. Besides, my kids always look forward to the Bolivar Ferry Ride each year, which is free. It also gives us a chance for one last restroom break and stretching our legs until we make it to our destination. Thank goodness we were in the front of the line although it was quite unnerving when they let the front gate down! My son (seen in pic) always enjoys getting out of the vehicle to go upstairs and view everything around him. During the daylight you can see dolphins swimming around. Our Jeep summer adventures didn’t stop in Texas though. Less than a week later Janice and I were on our way to Traverse City, Michigan to begin working The Great Race, a vintage car rally that went from Traverse City, MI into Canada and around the Great Lakes that ended in Dearborn, MI. Each day we traveled anywhere from 200-300 miles during the actual rally. We were checkpoint workers so we had the opportunity to sit for nearly two hours watching 80-90 cars go by while we take their times. Some days we were lucky enough to get lunch at their lunch stops. The best part though was that since one of our overnight stops was in Buffalo, New York, Janice and I planned ahead that we would travel to Niagara Falls. The Great Race trip total was two weeks long and 3,600 miles. Add that to the Texas trip and JeepGirl nearly did 6,000 miles in four weeks! That put her total mileage at 280K.